Engineering Graduates & the candidates who are pursing or appearing final year of b.tech or recently completed b.tech degree should get Government jobs as per their trades latest recruitment/vacancy details here. Engineering Graduates recruiting Government of India owned Public Sector Undertakings Companies / Organizations List: BHEL, BEL, Coal India, HPCL, EIL, BPCL, Mazagon Dock, MECON, NACL, NLC, NMDC, SAIL, NTPC, IOCL, ONGC, Power Grid, Railtel, RITES, UCI etc. 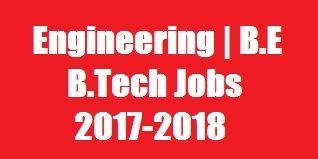 0 Response to "New & upcoming Engineering | B.E/B.Tech Jobs 2017-2018"